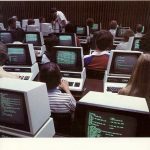 Released 1980: In the early 80’s, the “micro” computer had become both a hobbies machine and a learning tool. It was also becoming an affordable tool for small businesses. 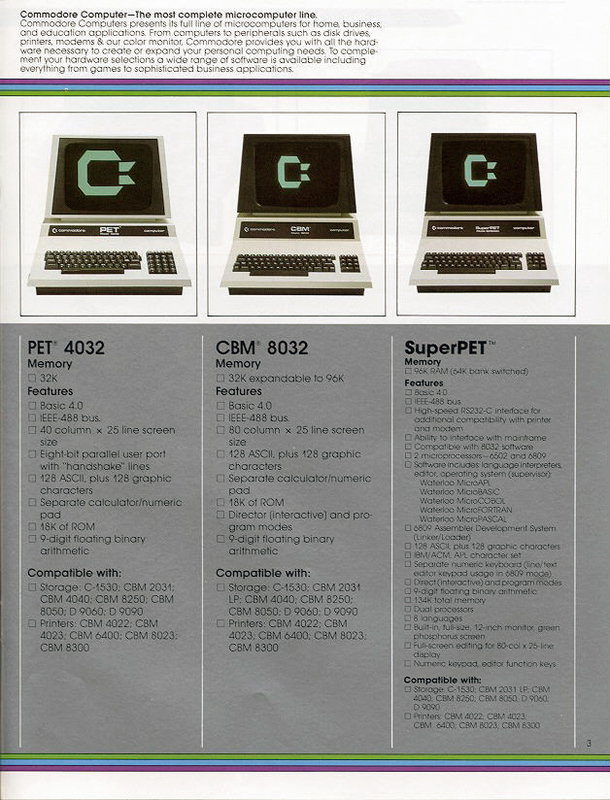 Commodore charged into this new market with upgraded versions of their popular “PET/CBM” line called the CBM 8000 series. 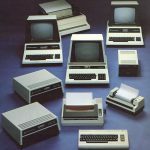 The 8000 series is characterized by their 80 column screens, which were a first for the PET series, and their “business” (non graphic) style keyboards. 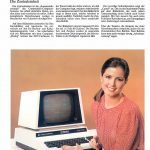 Commodore also had their engineers to break the 32 KB architectural barrier and introduced external memory expansion option with 64 KB additional RAM. 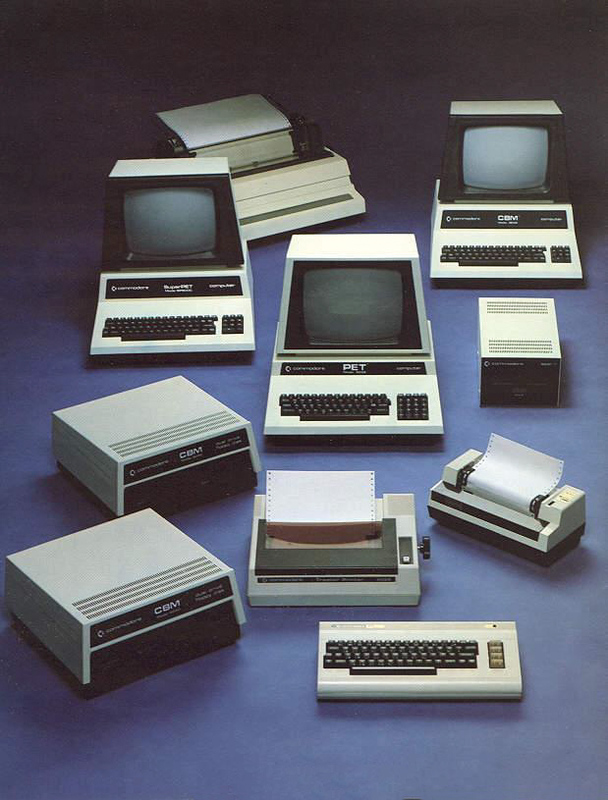 The 8000-series includes the advanced BASIC 4.0 environment that was first introduced with the 4000-series (40 column). 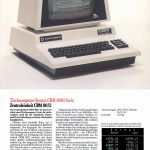 Check out my CBM 3032 page for more general information on Commodore PET/CBM computers. Unfortunately, many of the great games and programs that have been written and designed for the CBM/PET 40 column screens no longer work on these new 80 column models. 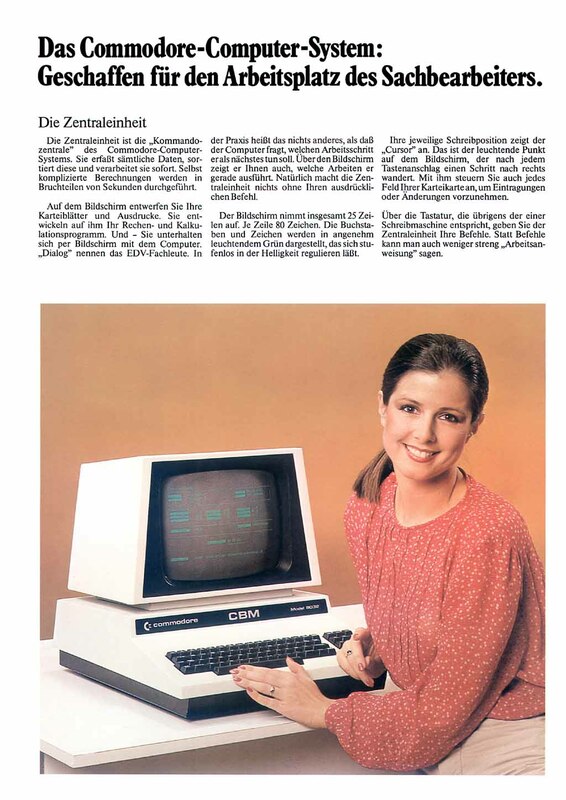 Luckily, there is programs like Soft-40 that emulates the 40 column screen. Soft-40 allows your 80 column machine to behave much like a 40-column machine. Games that poke to the screen will display correctly. It does this by re-programming the 80-column PET’s CRTC controller to only show 40 columns per line. The left and right margins are increased, leaving 40 (squished) columns in the middle of the screen. 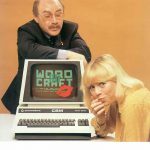 That solves one major problem, but be aware that some 40-column software expects to have a “graphics” keyboard and this makes some game controls messed up and some keys are mapped to other keys than instructed. 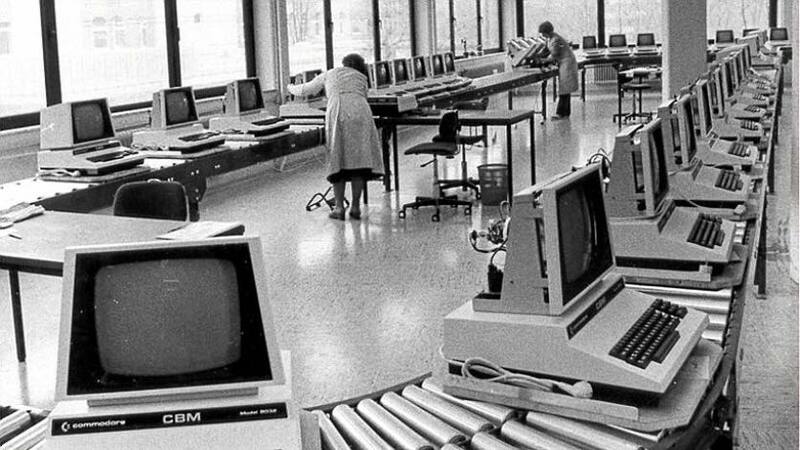 Commodore offered 64 KB upgrade boards that would give the 8032 an impressive 96 KB of memory. 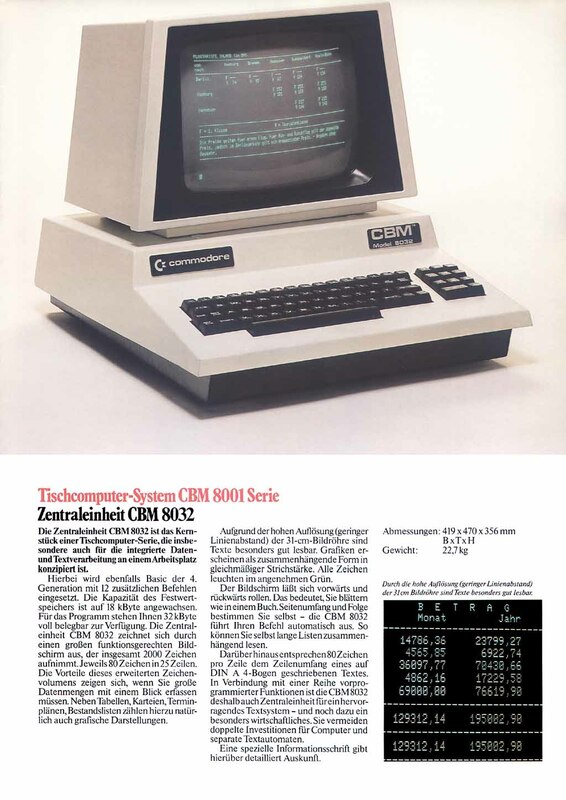 Later, Commodore produced a new model, the CBM 8096, which contained the boards already installed. 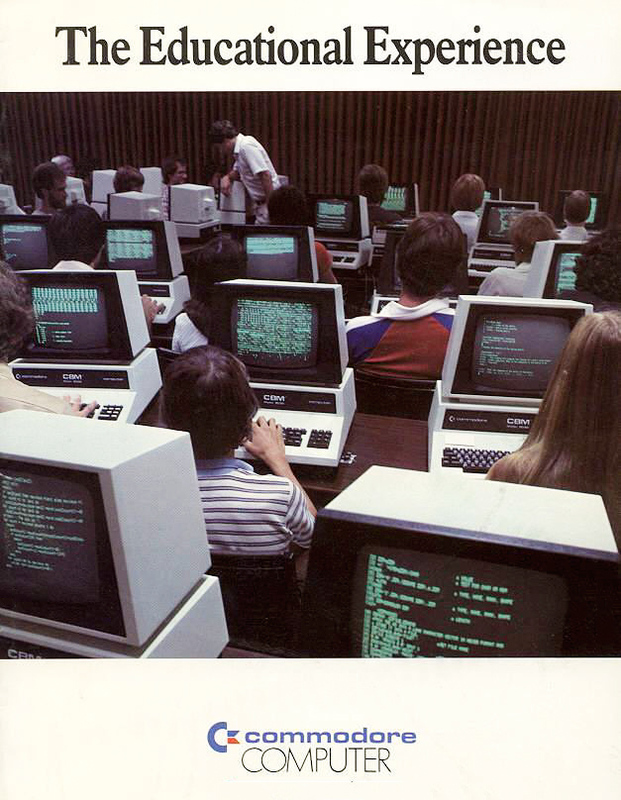 However, little software was written to take advantage of the 64 KB expansion cards, but some programs did indeed. 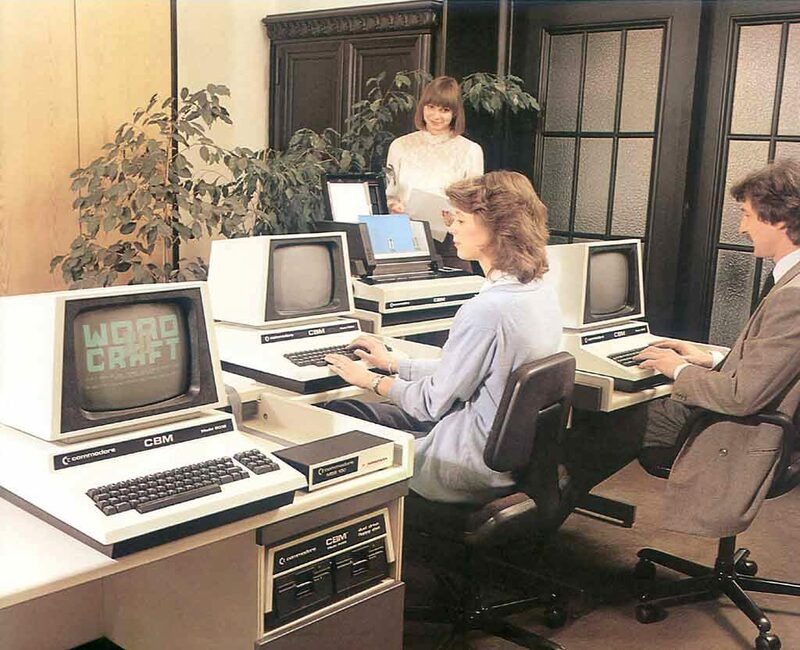 CBM 8032 computers running WordCraft word processor. Image from a product brochure. Bought mine here in Norway to a very good price, but it was a bit to far a way to drive so I ended up sending the seller a box with various carpets etc. so the seller could easy ship the computer back to me. It worked out great as the computer arrived in one piece. 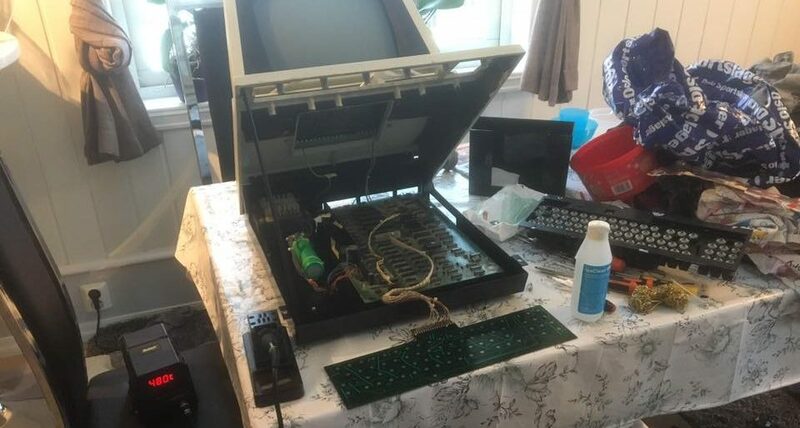 The computer worked right out of the box, It just needed a little cleaning. The left SHIFT key was not working properly, so I took the keyboard apart. After cleaning the keyboard PCB and the contact pads on the key “pins” with alcohol, also the left SHIFT key now works 100%. The keyboard was a bit loose due to unoriginal long screws underneath, so I replaced those and the keyboard is now tight in place. 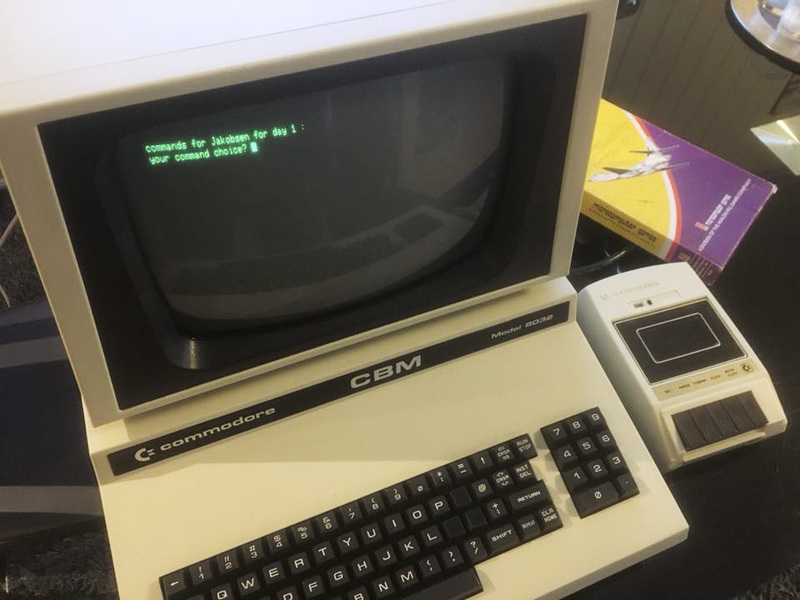 My Commodore CBM 8032 with lid open and keyboard dismantled . I also opened the monitor cover and increased the display height a little as the boarders was a bit large on the awesome built in 12″ monitor. I also wanted to increase the width slightly, but the “adjustable coil” for was seated to tight and I was afraid to damage it, so I decided to leave it as it is for now. Inside I found a mystical Commodore MOS ROM chip in one of the two “expansion” ROM sockets. The numbers on the chip seemed removed with purpose, so they could not be read. After some resource I found out this is actually a VisiCalc copy-protection ROM, an early type of “dongle”. It’s actually originally a firmware ROM for a Commodore printer that is used for this. 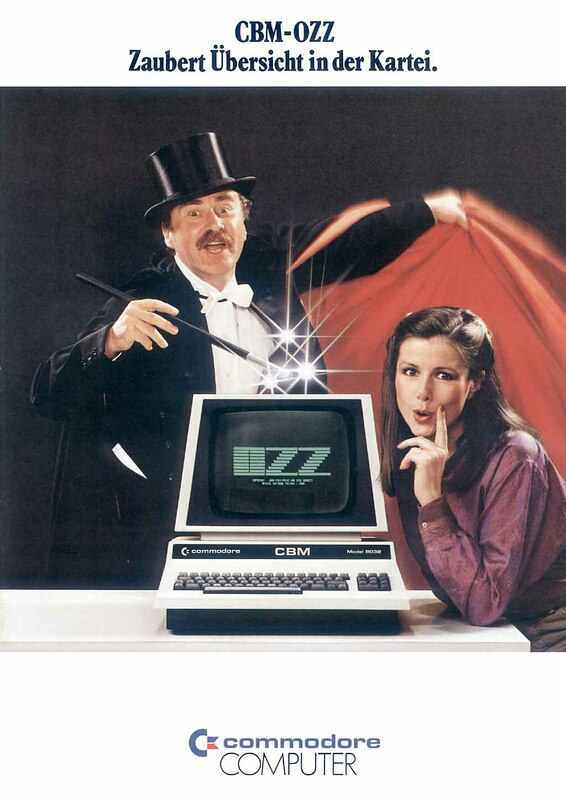 Probably they could get a large enough number of these ROM’s for an affordable price from Commodore for some reason. I tested out VisiCacl version 1.75A that requires the protection ROM and it worked right away. 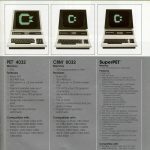 Luckily, I’ve already got a floppy/hard drive emulator called petSD+ (www.primrosebank.net) that I bought for my CBM 3032 computer. It uses SD-memory cards for storage and makes it very easy to transfer software from a PC. I had to buy an additional IEEE-488 cable for it and an adapter for connecting it to the “non-standard” pin-out IEEE connector on the computer. I also got a box to house this unit, only had to cut and drill out some holes for the connectors and buttons. I highly recommend the petSD+, it also supports normal sub-directories and disk image files can be entered just like directories, very practical. My CBM8032 came with Norwegian character set which got three ekstra letters to it, “ÆØÅ-æøå”. This messes up to apperance for some games as those letters replaces some of the PETSCII graphical characters like the “vertical line” symbol. I want to burn an EPROM with the standard character set and replace the “Norwegian ROM” to fix this issue. 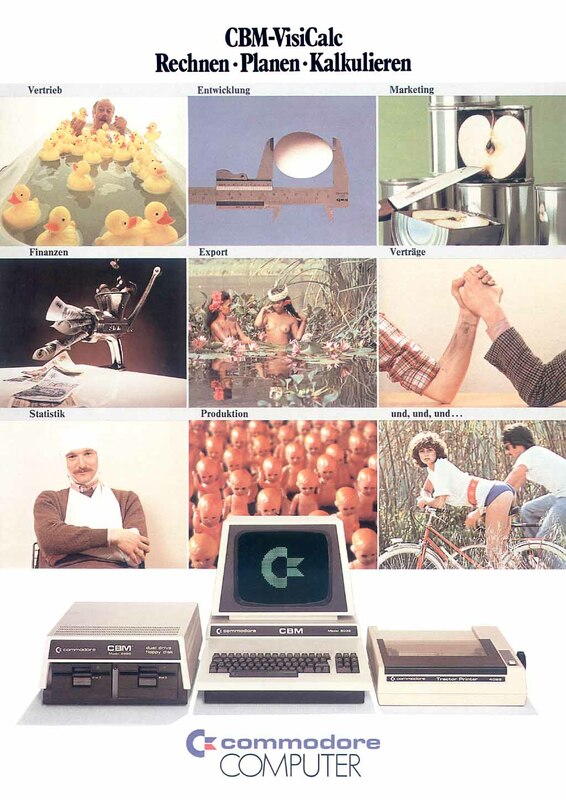 From a Commodore product brochure. From a product brochure, software advert. 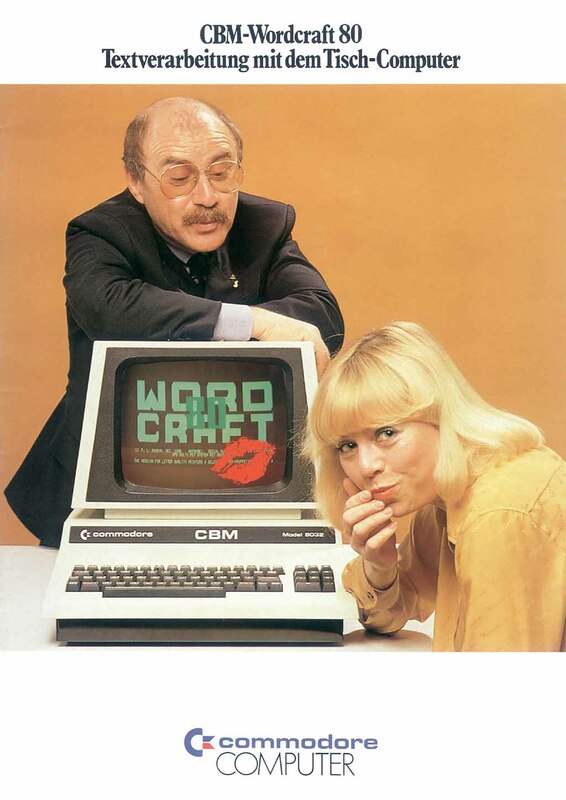 From a product brochure, Wordcraft80 advert. 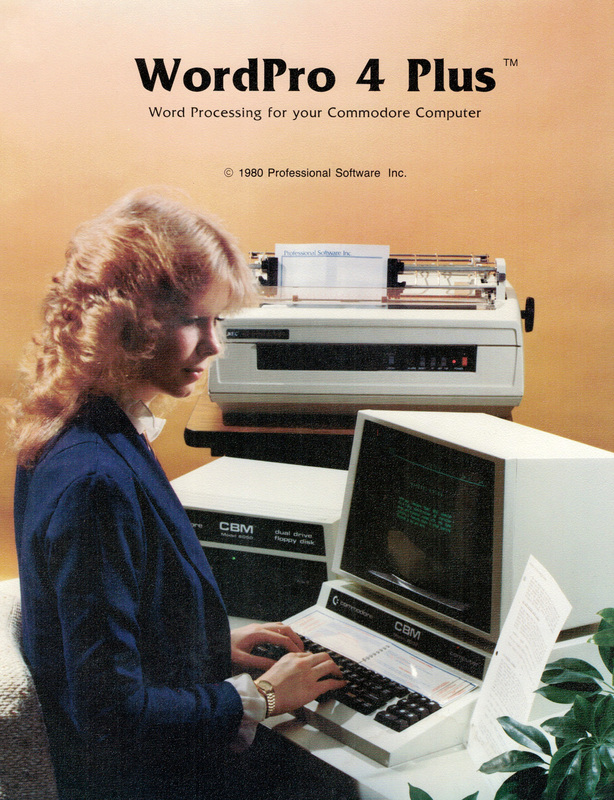 WordPro 4 Plus advert with CBM 8032. 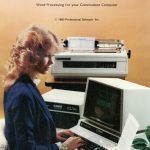 CBM 8032 in a product brochure.